Well I am a few minutes late. This is meant for 4th May oh well… I’ll start regular but end with something special today, because it is quite a special day, and it deserves quite a special whisky. And happiness and goodness ever surprise you like little squeals at the door. 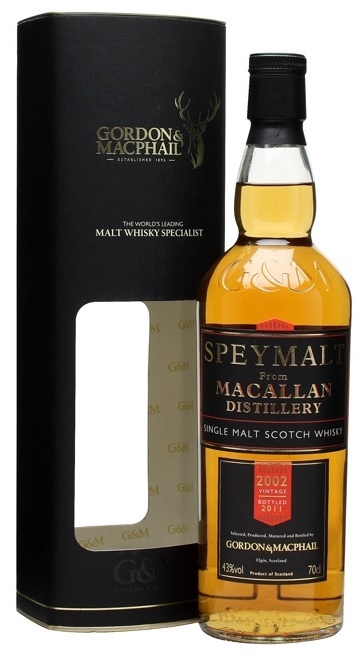 This is G&M’s series usually associated with their Macallan, and do they have a lot of it. 2002 must be one of the youngest releases to date I think, the vintages stretch back to the 60s and earlier! Might I also add … at a substantial discount to the officials? Nose: The very beginnings of sherry maturation. Light orangeade and a sprinkle of raisins on a bed of malt, buttery round but clearly young malt. Maybe a bit of tobacco leaf too. Not feinty but clearly a bit raw. Fortunately Macallan’s natural spirit seems to be quite sweet and thick and round. Bit vegetable oil. Palate: Well young and somewhat hot even at 43%. Quite raw and really not far from new make despite the obvious sherry veneer. But thick body and great mouthfeel. Getting really bitter. Yes it’s young, but already showing a very promising spirit quality. Macallan itself is a tasty thing I think. Ok funny one, this is bottled by Quality Spirits International (who??) for a Thai company, International Wine & Spirits (who??!) And what has that got to do with Winston Churchill, who famously only drank Johnnie Walker Black Label, and is the use of his image licensed at all? Nose: Huh. This is actually quite good despite the low abv. Echoes of fruitiness. Not kidding. Not even sure there’s any sherry in it but its a barky resinous one, with some darker spices like aniseed and some heavier herbals. Fairly complex. Like a thicker, heavier grassy Littlemill. Palate: Ah the abv hurts it here. Fairly soft with grassy herbaceous complexity. Still slightly fruity. Actually nice weight nice roundness. Linseed oil, great mouthfeel. Quite straightforward. Hey! Not bad not bad at all that is to say very decent and that’s hamstrung by the abv. 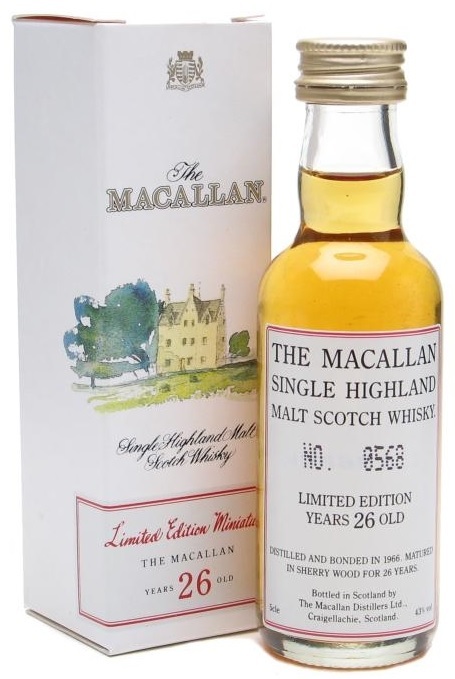 Interesting fruitiness not apparent in most new Macallan. A Place Called Macallan. Hidden in a fold of wooded hills, lapped by the water of the Ringorm Burn as it hurries on its way to meet the fabled Spey below, stands the ancient manor-house of Easter Elchies, Home of the Macallan. The site of Whisky making for many generations, the distillery was formally accorded legal status in 1824. It has since become famous as the seat of Scotland’s most prized Malt Whisky. What is the secret of this Legendary Single Malt? Immemorially, the Macallan has been distilled by Craftsmen in the same estate in particularly small Hand-Beaten Copper Stills and whilst other distillers no longer insist on using oaken sherry casks, at Macallan this costly tradition is maintained. The results are shown partly in the Macallan’s sumptuous colour, partly in the ‘Nose’ and wholly, may we venture, in the glass. Its pre-eminence is confirmed in ‘blind’ tastings of the Finest Malt Whiskies where Macallan’s Premium Brand is regularly accorded the supreme accolade – The London Sunday Times panel, for example, proclaimed it outright winner by a clear thirty percentage points over its nearest rival. Ample confirmation – if confirmation is needed- of the definitive dictum on the Macallan… The Single Malt against which ultimately all the others must be judged. Remember this is pre-Edrington – they only bought the Macallan from Highland Distillers in 1999. Suffice to say a lot has changed since then. Nose: Deep and exotic. All sorts of fragrant woods – sandalwood, cedarwood, some apricot jam and maybe not far from a fortified sweet white wine. Noble One? Shades of darker spice like aniseed, also soot and brasso, and old cans of furniture polish. Old metal notes. Old leather. Most likely a refill sherry cask, but great balance and character. Palate: This hits the spot. As the nose suggests, it’s sweet with these light jammy notes, and the sherry-spirit balance checks all the boxes as expected. It’s no sherry monster but instead what it’s got is great vivacity and balance. The sweet-savoury sherry is there but does not outdo the refined spirit, all this despite the 43%. Still not huge in any way, rather a very elegant Macallan, even a bit reserved. Ah a bit more savoury-farmy at the rear. Finish: Long. Old coins ,dark fruit, bit of honey ham. Just really good. I won’t say excellent, but really good. 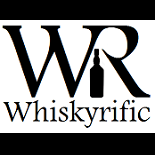 This entry was posted on May 5, 2016 by Whiskyrific in Macallan and tagged Macallan.